« Have you got your Holly Hobbie yet? 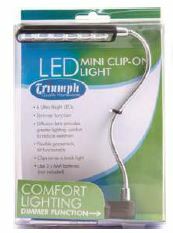 The best buy this month in our Triumph lighting range is the Mini LED Clip-on light with dimmer function. Available in glossy black with 6 ultra bright LEDs and flexible goose neck these little lights are ideal for close-up craft or the perfect personal reading light. This entry was posted on Tuesday, July 8th, 2014 at 6:43 am	and is filed under Uncategorized. You can follow any responses to this entry through the RSS 2.0 feed. Both comments and pings are currently closed.